I don’t know why but I’m just in love with these crazy and epic builds like the one you will see in this video: Volkswagen T1 bus powered by a Porsche 993 Turbo engine. The car has been spotted during a charity event for disabled people, called 6 Ruote di Speranza, where they have the chance to get on board on various cars and supercars and do some laps as passengers around Monza Circuit. This T1 was really perfect for the event because it shares 3 other seats for passengers in addition to the driver’s one. The creator of this car is the Swiss Fred Bernhard and he needed around 5 years to complete the project starting from a T3 van. He first decided to change the T3 body with the one of a T1 split-screen and widened it 21cm. After that he took the engine: he took the 3.6-litre twin turbo engine of a Porsche 993 Turbo tuned up to produce around 530 hp and 757 Nm of torque. 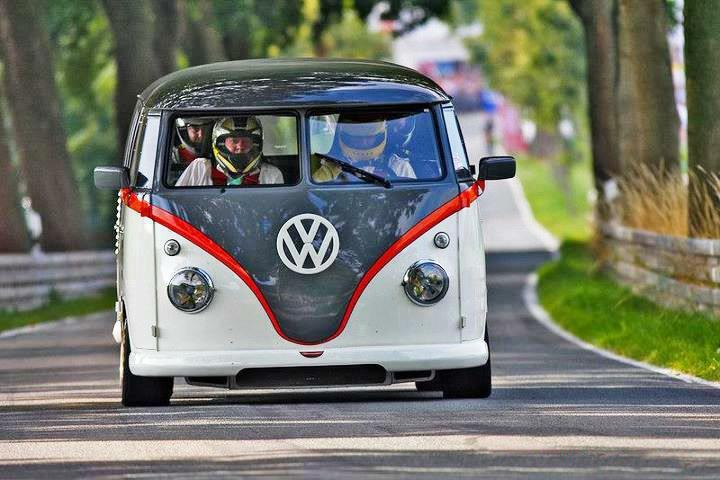 Everything else, from the chassis to the setup, has been made and modified to create a perfect track monster van. 1092HP VR6 12V Turbo 4WD PT7675 325km/h! These guys filmed Cars Nailing a massive Pot Hole in New Jersey! REAR Mounted LS1 in a Little VAN!? WTF!? SUBARU IMPREZA WRX STI INSANELY Big Turbo Sounds! One FAST Lexus with a BIG Turbo! TOP 10 Wrecks & FAIL Moments!